The pine savannah of north western Belize provides prime nesting habitat for the Belizean Yellow-headed Parrot, the country’s only endemic bird. Programme for Belize, the first partner of World Land Trust (WLT), owns and manages two areas of pine savannah. Vladimir Rodriquez, Manager of Hill Bank Field Station is in charge of conservation activities to protect the Yellow-headed Parrot. Although a subspecies rather than a species in its own right, the Yellow-headed Parrot (Amazona oratrix belizensis) is Belize’s only endemic bird. These talkative and charismatic birds are heavily poached for the local pet trade and protecting their nesting sites has become a top priority for Programme for Belize (PfB) in the past decade. The two habitats of pine savannah on the Rio Bravo reserve provide prime nesting grounds for these endangered birds. This includes the Rancho Pine Savannah and the San Felipe Pine Savannah. The San Felipe Pine Savannah is by far the most disturbed of the two sites and is heavily logged by locals from San Felipe. When the time comes for these birds to nest the few Yellow-headed Parrots that get the chance to do so are swiftly poached, so very few if any Yellow-headed Parrots successfully breed here. On the contrary, the Rancho Pine Savannah has very healthy stands of pine trees that are both dead and living in which these parrots can nest. The difficulty for locals from the villages of Rancho Dolores and Lemonal to access this area is what prevents the Yellow-headed Parrots from being poached as easily here as they are in the San Felipe Pine Savannah. Plus, PfB has an active ranger patrol of this savannah during the nesting season, which gives the birds a much better chance of fledging their young. In the San Felipe Savannah, due to lack of resources, there is no active patrol presence specifically for this purpose. Fire damaged nest sites. © PfB. The nesting season for the Yellow-headed Parrot, and other parrot species for that matter, coincides with the peak beginning of the dry season and the fire season (March through to June). 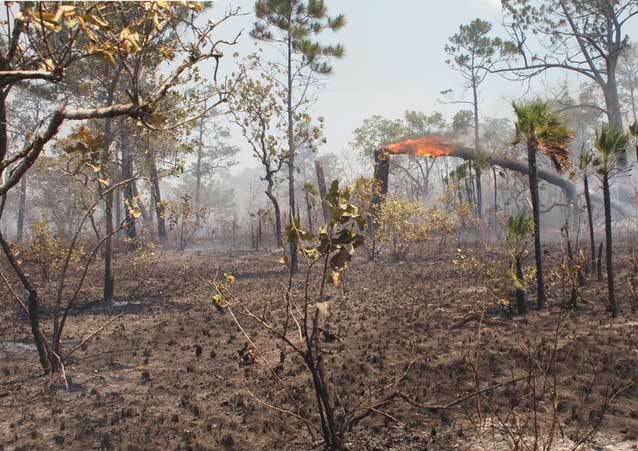 The savannahs are particularly vulnerable at this time of the year from natural and manmade fires, which pose the greatest threat to the nesting success of these birds. For this reason, PfB has increased the frequency of ranger patrols in the savannah areas and fires are dealt with immediately wherever possible. Within the Rancho Pine Savannah PfB rangers are equipped to handle these situations and are provided with proper communication equipment, an all-terrain vehicle (ATV), bladder bags, rakes and fire swatters. Rangers George Albert Tucker and Javier Sutherland are the rangers that have been most active in this field. They are the most knowledgeable about the Rancho Pine Savannah and the nesting sites within it. Their years of experience allow PfB to get the best results in terms of nest monitoring and data collection. In 2015 an expert climbing guide, who carries out similar work to protect Scarlet Macaws in the Chiquibul Forest, trained rangers Javier Sutherland and Milgar Molina for four days in May. 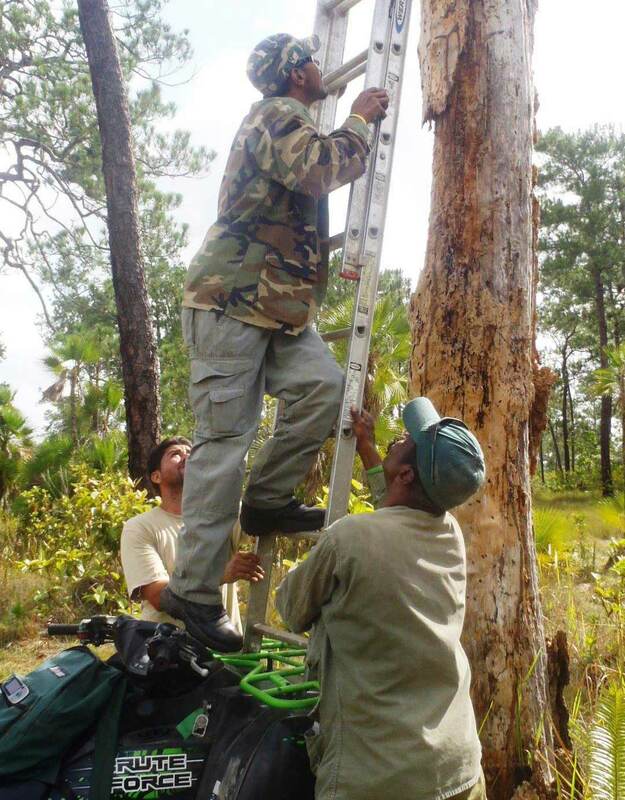 Ismael Mai of the Scarlet Six team from the Cayo District showed the two rangers how to use climbing gear to be able to monitor parrot nests high up in the pine trees. With the proper gear and perhaps one more session in this type of training, our rangers can provide more detailed information of parrot nests high up in trees. (At the moment the only nests they can monitor are those that they can reach using a 20 foot ladder.) All three rangers have received support from WLT’s Keepers of the Wild programme. Rangers inspect nesting sites. © PfB. Also in May last year Dr Lora Kim and Charles Britt came to East Gate to conduct an assessment of the overall health of the young yellow headed parrots in the Rancho Pine Savannah and particularly those that were likely to be poached near the village of Lemonal. 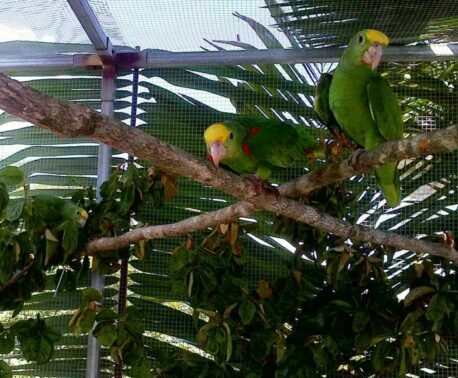 Of the 14 Yellow-headed Parrots that were assessed during their visit, five were taken to the Belize Bird Rescue Center because they were deemed of being at risk for poaching due to their location. 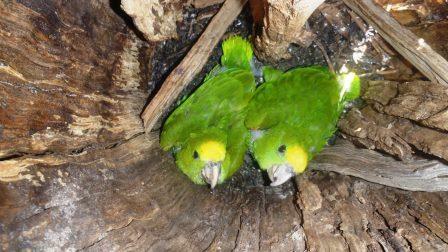 One younger Yellow-headed Parrot chick was left at East Gate for the rangers to monitor and fledge. In 2015 nesting activity was first reported in the Rancho Pine Savannah in early March and by the first week of July there was no more nesting activity. This gives a total of four months for the parrots to locate a nest, lay eggs, raise their young and fledge them from the nest. Of the 109 nest sites identified, 77 were considered to be active either because parrots were seen coming from inside the cavity of the nest or close to it or because the area around the cavity of the nest showed chewed or bite marks. It is not always possible to confirm whether or not nests are active, nor to verify how many eggs or young are in the nest. The height of the tree coupled with the safety of climbing the tree itself (either because it is rotten or too branchy) determined in most cases that the nest could not be searched. Nests that were confirmed as being poached showed clear signs around the nest that there was some type of disturbance to be able to take out the young birds. In total, only nine chicks were recorded as poached from nests that had previously been searched by the rangers carrying out a physical check and count of the birds in the nest. It may very well be that more nests were poached than were recorded but nine chicks poached is the figure verified on the ground by rangers. Overall, PfB’s results show a successful Yellow-headed Parrot breeding season at the Rancho Pine Savannah in 2015. Fires did not break out in this area, very few nests were poached and although there was quite a bit of illegal entry into the savannah the constant patrols in the areas known to be nesting sites kept poachers from having a free for all. PfB was able to provide the necessary transportation for rangers at East Gate which includes the ATV which makes a huge difference when it comes to mobility within the savannah. Two bridges were fixed and this allowed access into areas that were high priority for nesting and monitoring. Having the required personnel on site as much as possible also made a difference and the central office provided the necessary support at all times when requested; either with equipment, fuel or staff. The ability to now climb 60 feet up into the fire tower also makes a significant difference in both monitoring for poachers at night and in fire detection. If we can build on what we now know, and have in terms of equipment, we can surely have another successful parrot season in the coming year. World Land Trust (WLT) launched its first conservation programme in Belize in 1989, and continues to support PfB’s efforts to protect the Yellow-headed Parrot in the Rio Bravo Conservation and Management Area through the Keepers of the Wild programme. You can support PfB’s efforts to conserve the Yellow-headed Parrot by donating to WLT’s Keepers of the Wild programme.